Philadelphia has always been a hotbed for activity: from the Liberty Bell to the Barnes Foundation, its literally the city of ‘Brotherly Love’. 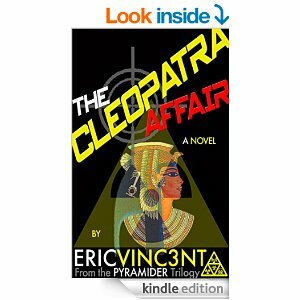 This endearing nickname plays in well with Eric Vincent’s tautly written “The Cleopatra Affair”, Book 3 of the Pyradmider Trilogy. The book’s richly layered plot devices and elements borrow on the city’s reputation of being historical and integral to the development of the modern society and spins it into a fervent paced work that had me white-knuckled until I turned the last page. The book’s titular hero, Tristan Boumann, is a protagonist with issues. It is these issues that make him at once both relatable and realistic. Through Boumann’s insatiable desire for excitement, whether self-admitted or not, Vincent allows the reader to root for Boumann as he embarks on a journey that chronicles all things Egypt, and the CIA, and a few other major plot points I won’t spoil for you. Boumann is just a little bit crazy – and that’s precisely what makes him so memorable as a protagonist. What Vincent does so supremely well is that manages to tell a story that while very rich in detail and historical accuracy, has an inherent imagination that allows the reader to become lost in time and to suspend their disbelief. I literally felt immersed in Vincent’s depicted world where anything could happen – and does.